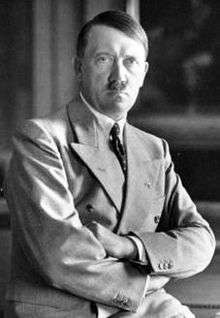 Adolf Hitler (German: [ˈadɔlf ˈhɪtlɐ]; 20 April 1889 – 30 April 1945) was a German politician who was the leader of the Nazi Party (Nationalsozialistische Deutsche Arbeiterpartei; NSDAP), Chancellor of Germany from 1933 to 1945, and Führer ("leader") of Nazi Germany from 1934 to 1945. As dictator of the German Reich, he initiated World War II in Europe with the invasion of Poland in September 1939 and was a central figure of the Holocaust. 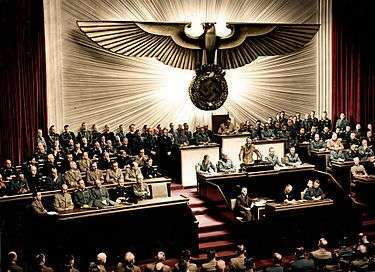 By 1933, the Nazi Party was the largest elected party in the German Reichstag, which led to Hitler's appointment as Chancellor on 30 January 1933. Following fresh elections won by his coalition, the Reichstag passed the Enabling Act, which began the process of transforming the Weimar Republic into Nazi Germany, a one-party dictatorship based on the totalitarian and autocratic ideology of National Socialism. Hitler aimed to eliminate Jews from Germany and establish a New Order to counter what he saw as the injustice of the post-World War I international order dominated by Britain and France. His first six years in power resulted in rapid economic recovery from the Great Depression, the effective abandonment of restrictions imposed on Germany after World War I, and the annexation of territories that were home to millions of ethnic Germans—actions which gave him significant popular support. Hitler sought Lebensraum ("living space") for the German people in Eastern Europe. His aggressive foreign policy is considered to be the primary cause of the outbreak of World War II in Europe. He directed large-scale rearmament and on 1 September 1939 invaded Poland, resulting in British and French declarations of war on Germany. In June 1941, Hitler ordered an invasion of the Soviet Union. By the end of 1941 German forces and the European Axis powers occupied most of Europe and North Africa. Failure to defeat the Soviets and the entry of the United States into the war forced Germany onto the defensive and it suffered a series of escalating defeats. In the final days of the war, during the Battle of Berlin in 1945, Hitler married his long-time lover, Eva Braun. On 30 April 1945, less than two days later, the two killed themselves to avoid capture by the Red Army, and their corpses were burned. Under Hitler's leadership and racially motivated ideology, the Nazi regime was responsible for the genocide of at least 5.5 million Jews and millions of other victims whom he and his followers deemed Untermenschen ("sub-humans") and socially undesirable. Hitler and the Nazi regime were also responsible for the killing of an estimated 19.3 million civilians and prisoners of war. In addition, 29 million soldiers and civilians died as a result of military action in the European Theatre of World War II. The number of civilians killed during the Second World War was unprecedented in warfare, and constitutes the deadliest conflict in human history. 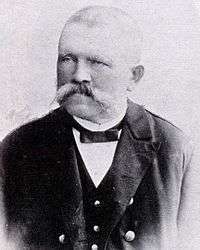 Hitler's father Alois Hitler, Sr. (1837–1903) was the illegitimate child of Maria Anna Schicklgruber. The baptismal register did not show the name of his father, and Alois initially bore his mother's surname Schicklgruber. In 1842, Johann Georg Hiedler married Alois's mother Maria Anna. Alois was brought up in the family of Hiedler's brother, Johann Nepomuk Hiedler. In 1876, Alois was legitimated and the baptismal register changed by a priest to register Johann Georg Hiedler as Alois's father (recorded as "Georg Hitler"). Alois then assumed the surname "Hitler", also spelled as Hiedler, Hüttler, or Huettler. The Hitler surname is probably based on "one who lives in a hut" (German Hütte for "hut"). Nazi official Hans Frank suggested that Alois's mother had been employed as a housekeeper for a Jewish family in Graz, and that the family's 19-year-old son Leopold Frankenberger had fathered Alois. No Frankenberger was registered in Graz during that period, and no record has been produced of Leopold Frankenberger's existence, so historians dismiss the claim that Alois's father was Jewish. 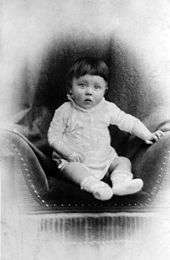 Adolf Hitler was born on 20 April 1889 in Braunau am Inn, a town in Austria-Hungary (in present-day Austria), close to the border with the German Empire. He was one of six children born to Alois Hitler and Klara Pölzl (1860–1907). Three of Hitler's siblings—Gustav, Ida, and Otto—died in infancy. When Hitler was three, the family moved to Passau, Germany. There he acquired the distinctive lower Bavarian dialect, rather than Austrian German, which marked his speech throughout his life. The family returned to Austria and settled in Leonding in 1894, and in June 1895 Alois retired to Hafeld, near Lambach, where he farmed and kept bees. Hitler attended Volksschule (a state-owned school) in nearby Fischlham. The move to Hafeld coincided with the onset of intense father-son conflicts caused by Hitler's refusal to conform to the strict discipline of his school. Alois Hitler's farming efforts at Hafeld ended in failure, and in 1897 the family moved to Lambach. The eight-year-old Hitler took singing lessons, sang in the church choir, and even considered becoming a priest. In 1898 the family returned permanently to Leonding. The death of his younger brother Edmund, who died from measles in 1900, deeply affected Hitler. He changed from a confident, outgoing, conscientious student to a morose, detached boy who constantly fought with his father and teachers. Alois had made a successful career in the customs bureau and wanted his son to follow in his footsteps. Hitler later dramatised an episode from this period when his father took him to visit a customs office, depicting it as an event that gave rise to an unforgiving antagonism between father and son, who were both strong-willed. Ignoring his son's desire to attend a classical high school and become an artist, Alois sent Hitler to the Realschule in Linz in September 1900. [lower-alpha 1] Hitler rebelled against this decision, and in Mein Kampf stated that he intentionally did poorly in school, hoping that once his father saw "what little progress I was making at the technical school he would let me devote myself to my dream". From 1905, Hitler lived a bohemian life in Vienna, financed by orphan's benefits and support from his mother. He worked as a casual labourer and eventually as a painter, selling watercolours of Vienna's sights. The Academy of Fine Arts Vienna rejected him in 1907 and again in 1908, citing "unfitness for painting". The director recommended that Hitler study architecture, which was also an interest, but he lacked academic credentials as he had not finished secondary school. On 21 December 1907, his mother died of breast cancer at the age of 47. Hitler ran out of money and was forced to live in homeless shelters and men's hostels. At the time Hitler lived there, Vienna was a hotbed of religious prejudice and racism. Fears of being overrun by immigrants from the East were widespread, and the populist mayor Karl Lueger exploited the rhetoric of virulent anti-Semitism for political effect. German nationalism had a widespread following in the Mariahilf district, where Hitler lived. German nationalist Georg Ritter von Schönerer, who advocated Pan-Germanism, anti-Semitism, anti-Slavism, and anti-Catholicism, was one influence on Hitler. Hitler read local newspapers such as the Deutsches Volksblatt that fanned prejudice and played on Christian fears of being swamped by an influx of eastern Jews. Hitler also read newspapers that published the main thoughts of philosophers and theoreticians such as Darwin, Nietzsche, Le Bon and Schopenhauer. Hostile to what he saw as "Catholic Germanophobia", he developed an admiration for Martin Luther. 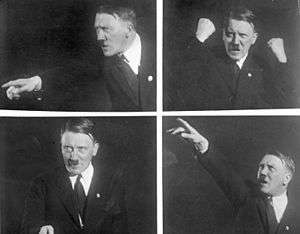 The origin and first expression of Hitler's anti-Semitism remain a matter of debate. Hitler states in Mein Kampf that he first became an anti-Semite in Vienna. His close friend, August Kubizek, claimed that Hitler was a "confirmed anti-Semite" before he left Linz. Several sources provide strong evidence that Hitler had Jewish friends in his hostel and in other places in Vienna. Historian Richard J. Evans states that "historians now generally agree that his notorious, murderous anti-Semitism emerged well after Germany's defeat [in World War I], as a product of the paranoid "stab-in-the-back" explanation for the catastrophe". Hitler received the final part of his father's estate in May 1913 and moved to Munich. Historians believe he left Vienna to evade conscription into the Austro-Hungarian Army. 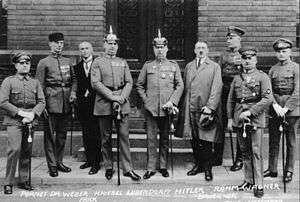 Hitler later claimed that he did not wish to serve Austria-Hungary because of the mixture of races in its armed forces. After he was deemed unfit for service—he failed his physical exam in Salzburg on 5 February 1914—he returned to Munich. 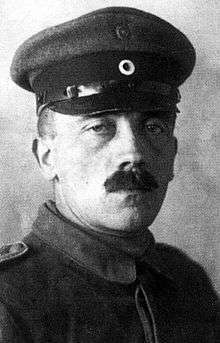 During his service at headquarters, Hitler pursued his artwork, drawing cartoons and instructions for an army newspaper. During the Battle of the Somme in October 1916, he was wounded in the left thigh when a shell exploded in the dispatch runners' dugout. 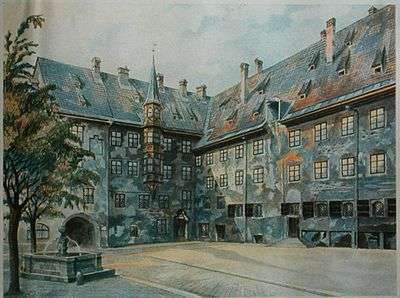 Hitler spent almost two months in hospital at Beelitz, returning to his regiment on 5 March 1917. On 15 October 1918, he was temporarily blinded in a mustard gas attack and was hospitalised in Pasewalk. 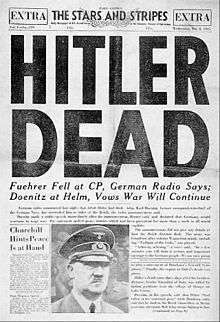 While there, Hitler learnt of Germany's defeat, and—by his own account—upon receiving this news, he suffered a second bout of blindness. Hitler described the war as "the greatest of all experiences", and was praised by his commanding officers for his bravery. His wartime experience reinforced his German patriotism and he was shocked by Germany's capitulation in November 1918. His bitterness over the collapse of the war effort began to shape his ideology. 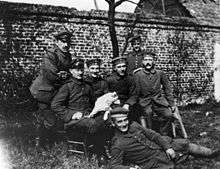 Like other German nationalists, he believed the Dolchstoßlegende (stab-in-the-back myth), which claimed that the German army, "undefeated in the field", had been "stabbed in the back" on the home front by civilian leaders and Marxists, later dubbed the "November criminals". 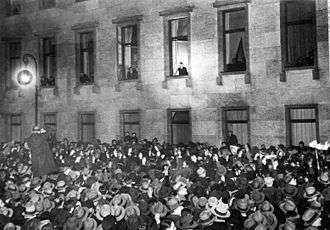 After World War I, Hitler returned to Munich. With no formal education or career prospects, he remained in the army. In July 1919 he was appointed Verbindungsmann (intelligence agent) of an Aufklärungskommando (reconnaissance commando) of the Reichswehr, assigned to influence other soldiers and to infiltrate the German Workers' Party (DAP). 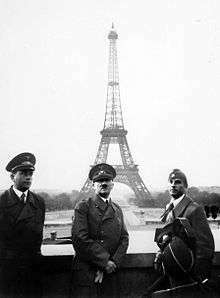 While monitoring the activities of the DAP, Hitler was attracted to the founder Anton Drexler's anti-Semitic, nationalist, anti-capitalist, and anti-Marxist ideas. Drexler favoured a strong active government, a non-Jewish version of socialism, and solidarity among all members of society. Impressed with Hitler's oratorical skills, Drexler invited him to join the DAP. 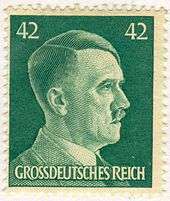 Hitler accepted on 12 September 1919, becoming party member 555 (the party began counting membership at 500 to give the impression they were a much larger party). Some visitors who met Hitler privately noted that his appearance and demeanour failed to make a lasting impression. While at Landsberg, Hitler dictated most of the first volume of Mein Kampf (My Struggle; originally entitled Four and a Half Years of Struggle against Lies, Stupidity, and Cowardice) to his deputy, Rudolf Hess. The book, dedicated to Thule Society member Dietrich Eckart, was an autobiography and exposition of his ideology. The book laid out Hitler's plans for transforming German society into one based on race. Some passages implied genocide. Published in two volumes in 1925 and 1926, it sold 228,000 copies between 1925 and 1932. 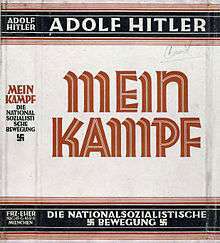 One million copies were sold in 1933, Hitler's first year in office. At the time of Hitler's release from prison, politics in Germany had become less combative and the economy had improved, limiting Hitler's opportunities for political agitation. 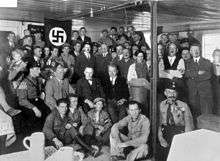 As a result of the failed Beer Hall Putsch, the NSDAP and its affiliated organisations were banned in Bavaria. 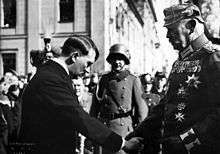 In a meeting with Prime Minister of Bavaria Heinrich Held on 4 January 1925, Hitler agreed to respect the authority of the state and promised that he would seek political power only through the democratic process. The meeting paved the way for the ban on the NSDAP to be lifted on 16 February. Hitler was barred from public speaking by the Bavarian authorities, a ban that remained in place until 1927. To advance his political ambitions in spite of the ban, Hitler appointed Gregor Strasser, Otto Strasser, and Joseph Goebbels to organise and grow the NSDAP in northern Germany. A superb organiser, Gregor Strasser steered a more independent political course, emphasising the socialist elements of the party's programme. Although Hitler had terminated his Austrian citizenship in 1925, he did not acquire German citizenship for almost seven years. This meant he was stateless, unable to run for public office, and still faced the risk of deportation. On 25 February 1932, the interior minister of Brunswick, Dietrich Klagges, who was a member of the NSDAP, appointed Hitler as administrator for the state's delegation to the Reichsrat in Berlin, making Hitler a citizen of Brunswick, and thus of Germany. In 1932, Hitler ran against Hindenburg in the presidential elections. A 27 January 1932 speech to the Industry Club in Düsseldorf won him support from many of Germany's most powerful industrialists. Hindenburg had support from various nationalist, monarchist, Catholic, and republican parties, and some Social Democrats. 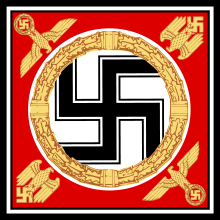 Hitler used the campaign slogan "Hitler über Deutschland" ("Hitler over Germany"), a reference to his political ambitions and his campaigning by aircraft. He was one of the first politicians to use aircraft travel for political purposes, and utilised it effectively. Hitler came in second in both rounds of the election, garnering more than 35 per cent of the vote in the final election. Although he lost to Hindenburg, this election established Hitler as a strong force in German politics. 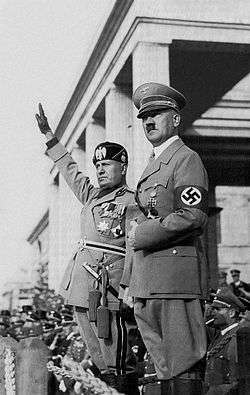 As chancellor, Hitler worked against attempts by the NSDAP's opponents to build a majority government. Because of the political stalemate, he asked Hindenburg to again dissolve the Reichstag, and elections were scheduled for early March. On 27 February 1933, the Reichstag building was set on fire. Göring blamed a communist plot, because Dutch communist Marinus van der Lubbe was found in incriminating circumstances inside the burning building. According to the British historian Sir Ian Kershaw, the consensus of nearly all historians is that van der Lubbe actually set the fire. Others, including William L. Shirer and Alan Bullock, are of the opinion that the NSDAP itself was responsible. At Hitler's urging, Hindenburg responded with the Reichstag Fire Decree of 28 February, which suspended basic rights and allowed detention without trial. The decree was permitted under Article 48 of the Weimar Constitution, which gave the president the power to take emergency measures to protect public safety and order. Activities of the German Communist Party (KPD) were suppressed, and some 4,000 communist party members were arrested. In private discussions in 1939, Hitler declared Britain the main enemy to be defeated and that Poland's obliteration was a necessary prelude for that goal. The eastern flank would be secured and land would be added to Germany's Lebensraum. Offended by the British "guarantee" on 31 March 1939 of Polish independence, he said, "I shall brew them a devil's drink". In a speech in Wilhelmshaven for the launch of the battleship Tirpitz on 1 April, he threatened to denounce the Anglo-German Naval Agreement if the British continued to guarantee Polish independence, which he perceived as an "encirclement" policy. Poland was to either become a German satellite state or be neutralised to secure the Reich's eastern flank and to prevent a possible British blockade. Hitler initially favoured the idea of a satellite state, but upon its rejection by the Polish government, he decided to invade and made this the main foreign policy goal of 1939. On 3 April, Hitler ordered the military to prepare for Fall Weiss ("Case White"), the plan for invading Poland on 25 August. In a Reichstag speech on 28 April, he renounced both the Anglo-German Naval Agreement and the German–Polish Non-Aggression Pact. Historians such as William Carr, Gerhard Weinberg, and Kershaw have argued that one reason for Hitler's rush to war was his fear of an early death. The fall of Poland was followed by what contemporary journalists dubbed the "Phoney War" or Sitzkrieg ("sitting war"). Hitler instructed the two newly appointed Gauleiters of north-western Poland, Albert Forster of Reichsgau Danzig-West Prussia and Arthur Greiser of Reichsgau Wartheland, to Germanise their areas, with "no questions asked" about how this was accomplished. Whereas Polish citizens in Forster's area merely had to sign forms stating that they had German blood, Greiser carried out a brutal ethnic cleansing campaign on the Polish population in his purview. Greiser complained that Forster was allowing thousands of Poles to be accepted as "racial" Germans and thus endangered German "racial purity". Hitler refrained from getting involved. This inaction has been advanced as an example of the theory of "working towards the Führer": Hitler issued vague instructions and expected his subordinates to work out policies on their own. Another dispute pitched one side represented by Himmler and Greiser, who championed ethnic cleansing in Poland, against another represented by Göring and Hans Frank, governor-general of the General Government territory of occupied Poland, who called for turning Poland into the "granary" of the Reich. On 12 February 1940, the dispute was initially settled in favour of the Göring–Frank view, which ended the economically disruptive mass expulsions. On 15 May 1940, Himmler issued a memo entitled "Some Thoughts on the Treatment of Alien Population in the East", calling for the expulsion of the entire Jewish population of Europe into Africa and reducing the Polish population to a "leaderless class of labourers". Hitler called Himmler's memo "good and correct", and, ignoring Göring and Frank, implemented the Himmler–Greiser policy in Poland. Hitler began a military build-up on Germany's western border, and in April 1940, German forces invaded Denmark and Norway. On 9 April, Hitler proclaimed the birth of the Greater Germanic Reich, his vision of a united empire of the Germanic nations of Europe, where the Dutch, Flemish, and Scandinavians were joined into a "racially pure" polity under German leadership. In May 1940, Germany attacked France, and conquered Luxembourg, the Netherlands, and Belgium. These victories prompted Mussolini to have Italy join forces with Hitler on 10 June. France and Germany signed an armistice on 22 June. 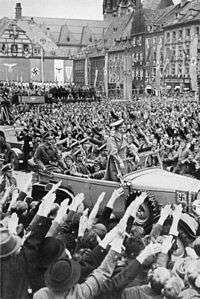 Kershaw notes that Hitler's popularity within Germany – and German support for the war – reached its peak when he returned to Berlin on 6 July from his tour of Paris. Following the unexpected swift victory, Hitler promoted twelve generals to the rank of field marshal during the 1940 Field Marshal Ceremony. On 22 June 1941, contravening the Hitler–Stalin Non-Aggression Pact of 1939, 4–5 million Axis troops attacked the Soviet Union. This offensive (codenamed Operation Barbarossa) was intended to destroy the Soviet Union and seize its natural resources for subsequent aggression against the Western powers. The invasion conquered a huge area, including the Baltic republics, Belarus, and West Ukraine. By early August, Axis troops had advanced 500 km (310 mi) and won the Battle of Smolensk. Hitler ordered Army Group Centre to temporarily halt its advance to Moscow and divert its Panzer groups to aid in the encirclement of Leningrad and Kiev. His generals disagreed with this change, having advanced within 400 km (250 mi) of Moscow, and his decision caused a crisis among the military leadership. The pause provided the Red Army with an opportunity to mobilise fresh reserves; historian Russel Stolfi considers it to be one of the major factors that caused the failure of the Moscow offensive, which was resumed in October 1941 and ended disastrously in December. Between 1939 and 1945, there were many plans to assassinate Hitler, some of which proceeded to significant degrees. The most well known came from within Germany and was at least partly driven by the increasing prospect of a German defeat in the war. In July 1944, in the 20 July plot, part of Operation Valkyrie, Claus von Stauffenberg planted a bomb in one of Hitler's headquarters, the Wolf's Lair at Rastenburg. 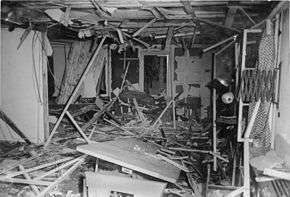 Hitler narrowly survived because staff officer Heinz Brandt moved the briefcase containing the bomb behind a leg of the heavy conference table, which deflected much of the blast. Later, Hitler ordered savage reprisals resulting in the execution of more than 4,900 people. The genocide was ordered by Hitler and organised and executed by Heinrich Himmler and Reinhard Heydrich. 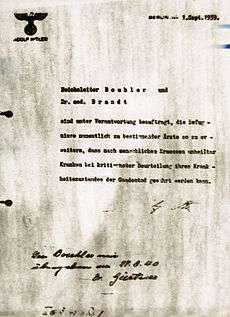 The records of the Wannsee Conference, held on 20 January 1942 and led by Heydrich, with fifteen senior Nazi officials participating, provide the clearest evidence of systematic planning for the Holocaust. On 22 February, Hitler was recorded saying, "we shall regain our health only by eliminating the Jews". Although no direct order from Hitler authorising the mass killings has surfaced, his public speeches, orders to his generals, and the diaries of Nazi officials demonstrate that he conceived and authorised the extermination of European Jewry. He approved the Einsatzgruppen—killing squads that followed the German army through Poland, the Baltic, and the Soviet Union—and was well informed about their activities. By summer 1942, Auschwitz concentration camp was expanded to accommodate large numbers of deportees for killing or enslavement. Scores of other concentration camps and satellite camps were set up throughout Europe, with several camps devoted exclusively to extermination. 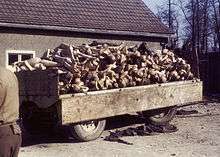 Between 1939 and 1945, the Schutzstaffel (SS), assisted by collaborationist governments and recruits from occupied countries, was responsible for the deaths of at least eleven million people, including 5.5 to 6 million Jews (representing two-thirds of the Jewish population of Europe), and between 200,000 and 1,500,000 Romani people. Deaths took place in concentration and extermination camps, ghettos, and through mass executions. Many victims of the Holocaust were gassed to death, whereas others died of starvation or disease or while working as slave labourers. In addition to eliminating Jews, the Nazis planned to reduce the population of the conquered territories by 30 million people through starvation in an action called the Hunger Plan. Food supplies would be diverted to the German army and German civilians. Cities would be razed and the land allowed to return to forest or resettled by German colonists. Together, the Hunger Plan and Generalplan Ost would have led to the starvation of 80 million people in the Soviet Union. These partially fulfilled plans resulted in the democidal deaths of an estimated 19.3 million civilians and prisoners of war. Hitler's policies resulted in the killing of nearly two million Poles, over three million Soviet prisoners of war, communists and other political opponents, homosexuals, the physically and mentally disabled, Jehovah's Witnesses, Adventists, and trade unionists. Hitler did not speak publicly about the killings, and seems never to have visited the concentration camps. Hitler was born to a practising Catholic mother and an anticlerical father; after leaving home Hitler never again attended Mass or received the sacraments. Speer states that Hitler made harsh pronouncements against the church to his political associates and though he never officially left it, he had no attachment to it. He adds that Hitler felt that in the absence of the church the faithful would turn to mysticism, which he considered a step backwards. 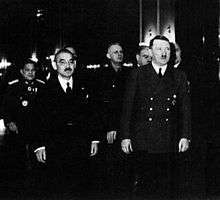 According to Speer, Hitler believed that either Japanese religious beliefs or Islam would have been a more suitable religion for the Germans than Christianity, with its "meekness and flabbiness". Historian John S. Conway states that Hitler was fundamentally opposed to the Christian churches. According to Bullock, Hitler did not believe in God, was anticlerical, and held Christian ethics in contempt because they contravened his preferred view of "survival of the fittest". He favoured aspects of Protestantism that suited his own views, and adopted some elements of the Catholic Church's hierarchical organisation, liturgy, and phraseology in his politics. Hitler viewed the church as an important politically conservative influence on society, and he adopted a strategic relationship with it that "suited his immediate political purposes". In public, Hitler often praised Christian heritage and German Christian culture, though professing a belief in an "Aryan Jesus", one who fought against the Jews. Any pro-Christian public rhetoric was at variance with his private statements, which described Christianity as "absurdity" and nonsense founded on lies. According to a U.S. Office of Strategic Services report, "The Nazi Master Plan", Hitler planned to destroy the influence of Christian churches within the Reich. His eventual goal was the total elimination of Christianity. This goal informed Hitler's movement early on, but he saw it as inexpedient to express this extreme position publicly. According to Bullock, Hitler wanted to wait until after the war before executing this plan. Researchers have variously suggested that Hitler suffered from irritable bowel syndrome, skin lesions, irregular heartbeat, coronary sclerosis, Parkinson's disease, syphilis, giant cell arteritis with temporal arteritis, and tinnitus. In a report prepared for the Office of Strategic Services in 1943, Walter C. Langer of Harvard University described Hitler as a "neurotic psychopath". In his 1977 book The Psychopathic God: Adolf Hitler, historian Robert G. L. Waite proposes that he suffered from borderline personality disorder. Historians Henrik Eberle and Hans-Joachim Neumann consider that while he suffered from a number of illnesses including Parkinson's disease, Hitler did not experience pathological delusions and was always fully aware of, and therefore responsible for, the decisions he was making. Theories about Hitler's medical condition are difficult to prove, and placing too much weight on them may have the effect of attributing many of the events and consequences of Nazi Germany to the possibly impaired physical health of one individual. Kershaw feels that it is better to take a broader view of German history by examining what social forces led to the Nazi dictatorship and its policies rather than to pursue narrow explanations for the Holocaust and World War II based on only one person. Hitler followed a vegetarian diet. At social events he sometimes gave graphic accounts of the slaughter of animals in an effort to make his dinner guests shun meat. Bormann had a greenhouse constructed near the Berghof (near Berchtesgaden) to ensure a steady supply of fresh fruit and vegetables for Hitler throughout the war. Hitler publicly avoided alcohol. He occasionally drank beer and wine in private, but gave up drinking because of weight gain in 1943. He was a non-smoker for most of his adult life, but smoked heavily in his youth (25 to 40 cigarettes a day). He eventually quit, calling the habit "a waste of money". He encouraged his close associates to quit by offering a gold watch to anyone able to break the habit. 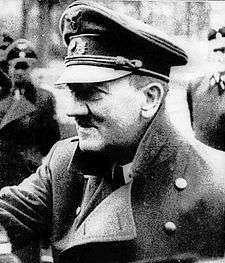 Hitler began using amphetamine occasionally after 1937 and became addicted to it in late 1942. Speer linked this use of amphetamine to Hitler's increasingly erratic behavior and inflexible decision making (for example, rarely allowing military retreats). Prescribed 90 medications during the war years, Hitler took many pills each day for chronic stomach problems and other ailments. He regularly consumed amphetamine, barbiturates, opiates, and cocaine. He suffered ruptured eardrums as a result of the 20 July plot bomb blast in 1944, and 200 wood splinters had to be removed from his legs. 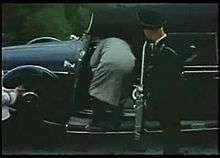 Newsreel footage of Hitler shows tremors of his left hand and a shuffling walk, which began before the war and worsened towards the end of his life. Ernst-Günther Schenck and several other doctors who met Hitler in the last weeks of his life also formed a diagnosis of Parkinson's disease. Hitler created a public image as a celibate man without a domestic life, dedicated entirely to his political mission and the nation. He met his lover, Eva Braun, in 1929, and married her in April 1945. In September 1931, his half-niece, Geli Raubal, committed suicide with Hitler's gun in his Munich apartment. It was rumoured among contemporaries that Geli was in a romantic relationship with him, and her death was a source of deep, lasting pain. Paula Hitler, the younger sister of Hitler and the last living member of his immediate family, died in 1960. 1 2 Shirer 1960, p. 27. 1 2 3 Jones 1989. ↑ Ghaemi 2011, p. .
Stolfi, Russel (March 1982). "Barbarossa Revisited: A Critical Reappraisal of the Opening Stages of the Russo-German Campaign (June–December 1941)". The Journal of Modern History. 54 (1): 27–46. doi:10.1086/244076. "1933 – Day of Potsdam". City of Potsdam. Retrieved 13 June 2011. "Eingabe der Industriellen an Hindenburg vom November 1932" [Letter of the industrialists to Hindenburg, November 1932]. Glasnost–Archiv. Retrieved 16 October 2011. Glantz, David (11 October 2001). "The Soviet‐German War 1941–45: Myths and Realities: A Survey Essay" (PDF). Clemson, SC: Strom Thurmond Institute of Government and Public Affairs, Clemson University. Retrieved 12 December 2012. "Hitler ersucht um Entlassung aus der österreichischen Staatsangehörigkeit" [Hitler's official application to end his Austrian citizenship] (in German). NS-Archiv. 7 April 1925. Retrieved 13 April 2012. Martin, Jonathan (creator, writer) (2008). World War II In HD Colour (television documentary). US: World Media Rights. Retrieved 27 August 2014. Redlich, Fritz C. (March 22, 1993). "A New Medical Diagnosis of Adolf Hitler: Giant Cell Arteritis—Temporal Arteritis". Arch Intern Med. 153 (6): 693–697. doi:10.1001/archinte.1993.00410060005001. PMID 8447705. Retrieved 22 November 2015. Weber, Thomas (2010a). "New Evidence Uncovers Hitler's Real First World War Story". BBC History Magazine. UK: Immediate Media Company. Archived from the original on 21 November 2014. Retrieved 19 November 2016.